Highly concentrated shampoo for effortless, gloss-sealing foam washing. With its novel formula, Raindance Shampoo is triple effective: cleans quickly and thoroughly as a shampoo, protects permanently against environmental and weather influences by polymer luster, achieves lasting visible depth luster. Spontaneous beading after rinse shows the reflective gloss seal. Frequent application is the consistency of the lacquer and contributes to the value of your vehicle. 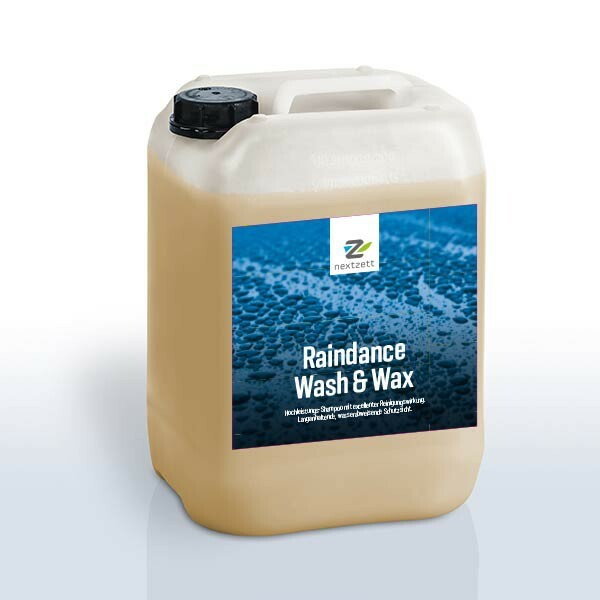 nextzett Raindance Wash & Wax contains multifunctional synthetic compounds, high performance polymers with long-term effect to the paint protection formula. Nextzett Due to its chemical composition, Raindance Wash & Wax not only has outstanding cleaning, but also nourishing and thus also protective functions. Due to its high substantivity from aqueous solutions, it attracts particularly hard surfaces. Even with more frequent use, no "build-up" effect is produced as it occurs with some conventional 2in1 products. Spray coarse dirt on vehicle surface with a sharp water jet. Approx. 50 ml of nextzett Raindance Wash & Wax in about 8 l of water. Wash car with washing glove or sponge. Thoroughly rinse the vehicle after car wash with plenty of water. Spontaneous beading shows the reflective gloss finish. Removing residual drops with a leather to avoid lime stains. To prevent scratches on painted surfaces, use only clean sponges or washing gloves for car wash. Avoid the sun. For optimal visibility, front windscreen and wiper blades with nextzett disc.